The Woolworth Building designed for Frank W. Woolworth by Cass Gilbert c. 1913 at 233 Broadway in New York City. When completed it became the tallest building in the world and held the title until 1930. 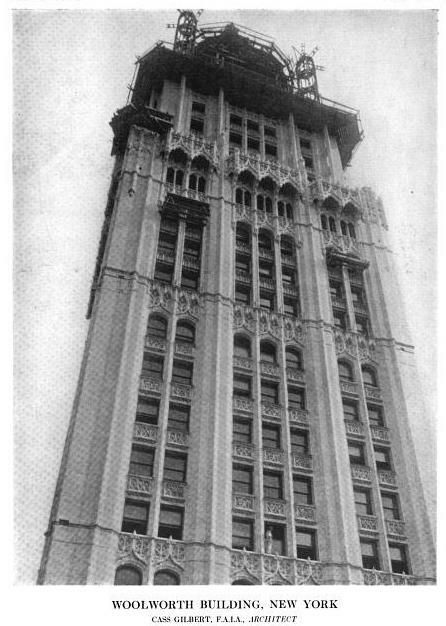 Click HERE for more on the Woolworth Building. 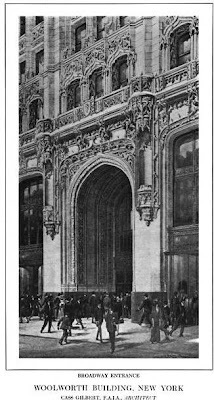 Click HERE for Christopher Gray's Streetscapes article on the Woolworth Building and HERE to see it on google street view. 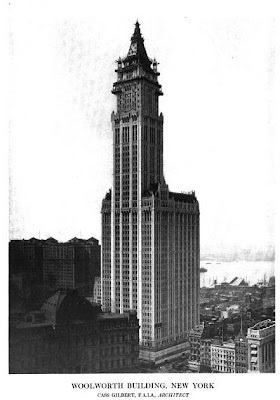 Photos from The American Architect, 1913. Cass Gilbert. Now there's an architect. Paul Goldberger, in a badly mixed metaphor, once called this the 'Mozart of Skyscrapers'( correctly, he should have referred to the building, the work, as the Mozart Symphony of Architecture, or Gilbert, the architect, as the Mozart of Architecture--(not to suggest that he was). One would think his editor at the Times, which in those days still cared about language and accuracy, would have caught it, but he didn't. I suppose Goldberger was building on the quote 'Architecture is Frozen Music', which is variously attributed to Schopenhauer, Goethe, von Schelling, and even Frank Lloyd Wright (but damned if I know actually who said it). A variation has Mme. de Stael describing music to Lord Byron as 'frozen architecture' (I guess she went to the same school of metaphor as Goldberger). 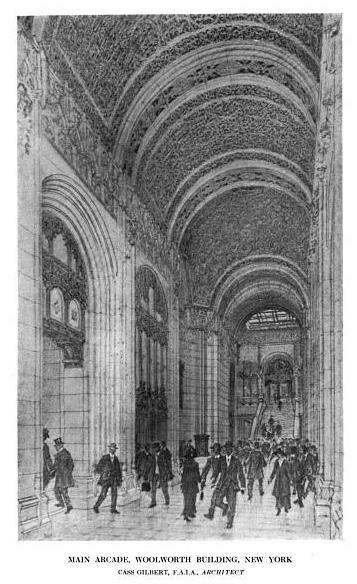 I once owned an extraordinary album of poetic John Wallace Gillies photographs of the Woolworth building, every conceivable view inside and out, top to bottom. It was Cass Gilbert's own office album (I also owned the album of the New York Customs house). Absolutely poetic. A Cass Gilbert post with not one mention of CPH? A dazed and confused archibuff gets up from the floor gasping for air and clutching his heart. The Woolworth Building is a master work. It accomplishes what any soaring skyscraper should do. It vastly improves and contributes enormously to the impressive skyline of downtown NYC and becomes iconic and irreplaceable in every contemporary view of New York and in everyones imagination. Even non-architectural enthusiasts appreciate this magnificent design and slender tower as it pierces the sky. While it has lost a few elements after a top to bottom restoration about 30 years ago, lately a new batch of towers is slowly encircling it and diminishing its once solitary presence in downtown NYC. Woolworth sure knew how to make a statement and a grand testiment to his rags to riches story. Can't iamgine NY without this gem. 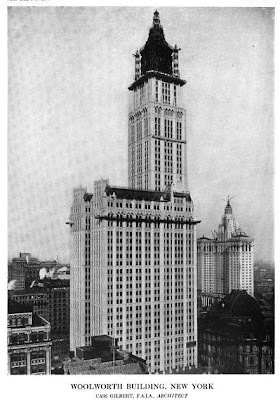 That Trump guy should take a lesson or two in how to build from Woolworth and Cass Gilbert. 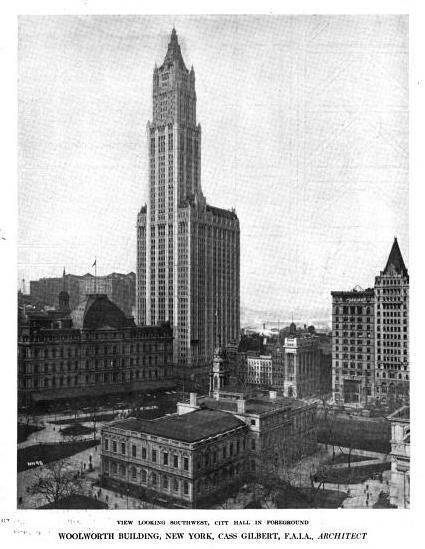 Also note the incredible Municipal Building by Mckim Mead and White in the lower left of the last photo, another spectacular skyscraper standout. Those were the days when both cities and individuals alike built lasting landmarks, not cheap bloated glass boxes meant to maximize FAR and zoning allowances.